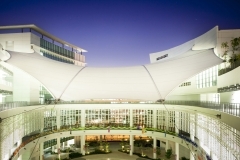 It is a common misconception that tensioned fabric structures are simple in design and easy to build. The final product may appear simplistic. 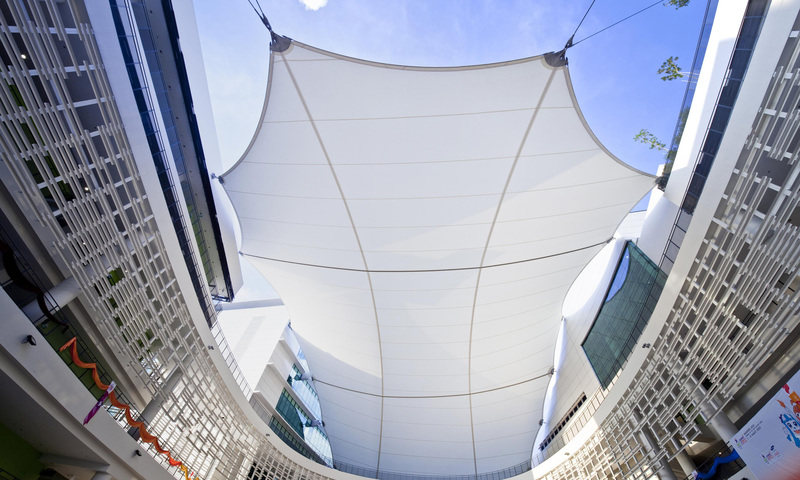 However, the design process is anything but simple, and is pivotal to the success of all tensioned fabric structure projects. 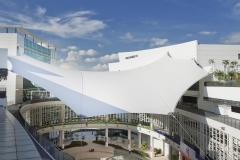 To illustrate the importance — and complexity — of the design process for tensioned membrane structures, we present a detailed account of a project for which Fabritecture was engaged to design and build for the new ITE West College development, in Singapore. 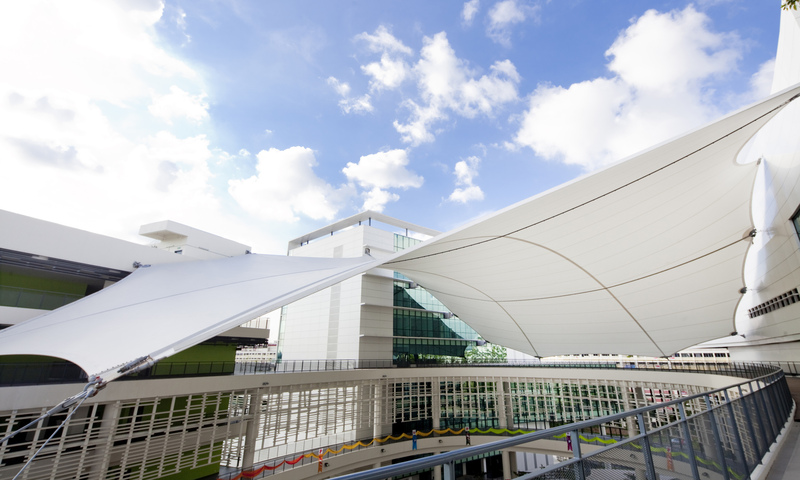 Our brief was to provide lightweight, aesthetic, weather protection over an outdoor events plaza and elevated walkways with an area of approximately 75m x 45m. The entire roof was to be supported from 4 high-rise buildings that surrounded the plaza, with no rigid support structure allowed. 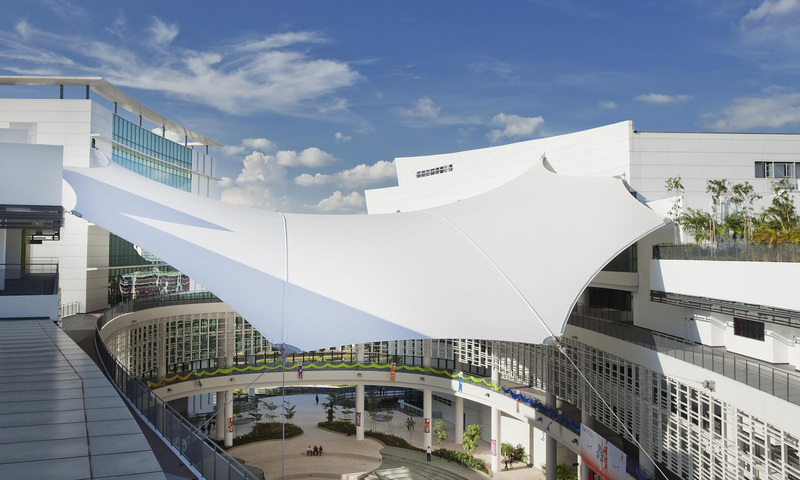 The 3,000 m2 PTFE canopy that was ultimately designed and installed by Fabritecture, sits at a height of between 20 and 35m, and is supported entirely by cables, providing a beautiful ‘floating’ form above the events plaza and walkways below. 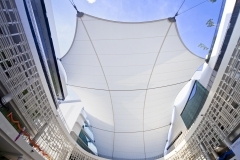 The PTFE membrane canopy was designed with an anticlastic form with a very high pre-stress of 5KN to accommodate the large spans. A complex system was designed to provide structural support to the canopy, comprising high-strength Galfan cables (two 75m over-fabric cables, two 45m under-fabric cables, catenary edge cables, and guy cables), steel membrane clamp plates, structural shackles, and complex structural steel wall brackets. Incredibly, the entire canopy system weighed only 6.5kg/m2 due to the efficient use of the surrounding concrete buildings to support the large forces generated by the tension structure. 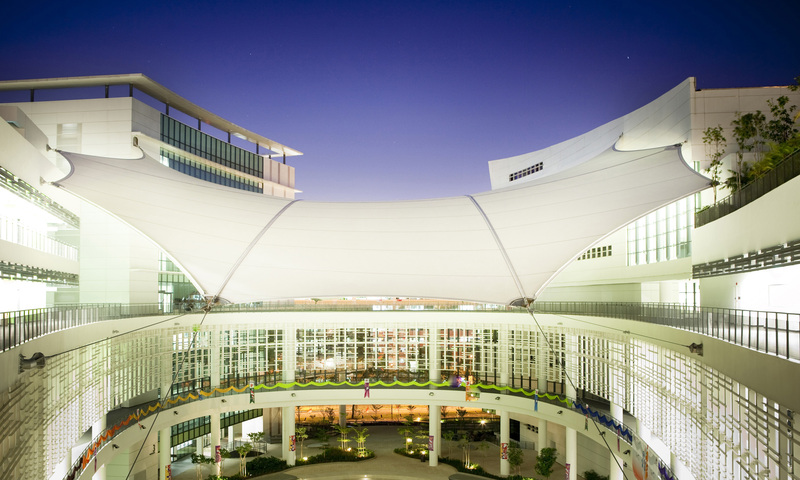 To achieve the required form and cover, the canopy had to be fixed to the concrete structures of four surrounding high rise buildings and a floating walkway, with a total of 24 fixing points which ranged from level 4 to level 10 of the buildings. Detailed structural analysis of the membrane roof needed to be completed so that the extreme forces generated could be taken into account when designing the high rise structures. In addition, 24 unique sets of high-strength cast-in bolts needed to be designed, supplied, positioned, and cast-in during the construction of the high rise structures. Prior to final detailing and patterning of the membrane roof, each set of cast-in bolts needed to be accurately surveyed due to the stringent tolerances required for the structural system to work effectively. Due to the lack of access to the fixing points, coupled with the extreme vertical height, the as-built survey was completed using a combination of traditional and 3D laser survey methods. Following completion of the as-built survey, the final patterning and detailing of the membrane roof was completed so that the Galfan structural cables, membrane plates, and steel brackets could be fabricated. During design, detailed analysis was undertaken of water flow off the canopy, as well as the thermal effect the canopy had on the airspace below the roof. A water diversion system was used in some areas, to control the water run-off from the roof. The installation of this canopy was equally as complex as its design. Access was a major constraint, due to the fact that no large and heavy access equipment could be located directly below the membrane roof meaning a crane could not be used to lift the roof into position. We worked with our engineers and rigging experts to design a complex and detailed lifting plan. Due to the chain motors only having 20metres of chain, a two-stage rigging system was devised using cable slings and a midpoint changeover rigging point. Once the membrane roof lifted into position, each point to be changed over and rigged to shackles and slings for safety (not left on chain motors). The lift ran smoothly and was completed in a period of 16hrs exactly as planned. Following the lift, the membrane roof was systematically tensioned to the side and end points using a combination of chain blocks and cable tifors. In order to tension the membrane to the correct fixing point design loads, final tension on the four main guy wires was completed using two 20-tonne hydraulic rams and pressure gauges. 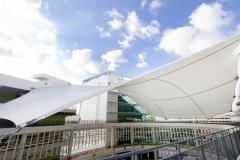 The initial tensioning of the 3,000m2 roof was carried out over a period of 8 days. The membrane was then further progressively tensioned over the next 2 weeks with the final tension on the main guy cables being completed using 2 of 20 tonne hydraulic rams with stress gauges, in order to monitor the tension forces needed for installation. 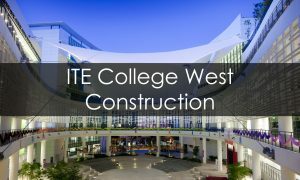 Overall, this unique project was one of the most challenging that Fabritecture has encountered. The end result: very simple in form, yet highly complex in design at every stage.